Populous have apparently completed the world’s first blockchain based invoice finance transaction, with the debtor having paid their invoice, completing the payment cycle. You may be aware that I have written previously about this, and discussed the security benefits of using blockchain to reduce invoice finance fraud. It would seem to me that the key to how useful this type of technology could be, hinges upon the degree to which using elements of the blockchain will allow you to achieve a quasi letter of credit, as is used in some trade finance transactions. A letter of credit, or LC, is normally issued by a bank, or trade finance house, and it sets out a number of terms that have to be met in order that a supplier receives payment for a shipment of goods. These terms may include providing proof of shipment of the goods, inspection certificates etc. The degree to which that element of control can be exerted using a blockchain based transaction, is likely to drive how attractive this technology is to invoice financing companies. My understanding, is that documents may be able to at be added to the blockchain, the key will be the level of sophistication that is possible. It would now be interesting to see if any of the current mainstream providers start to look at or use blockchain based mechanisms in order to underpin their own funding transactions. 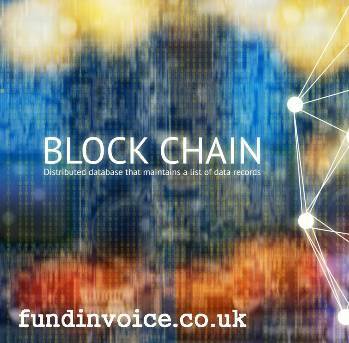 Does anyone know if anyone else is looking using blockchain to underpin their invoice financing?